THE BRITISH RAILWAY STORIES LTD: "Forward"
The motto of the Great Central Railway - which this J11 and D11 pair hail from - is "forward", hence the title. Copley Hill was home to many ex-GCR tank and tender engines, and doubtless would have seen one or the other, or both at the shed in its LNER and BR days. 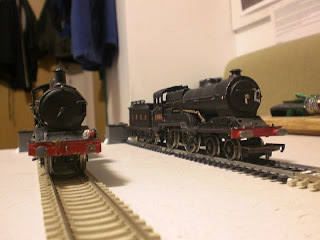 I bought these two models on a whim to do a restoration job on each and to make the locomotive stock a bit more varied. 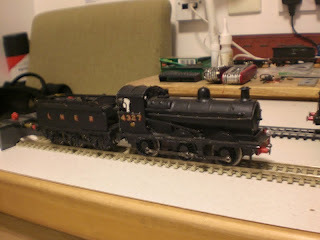 The two models are old white metal kits (unknown origins) and use an old Triang 3F and an old Hornby L1 set of chassis. The J11 will be overhauled first, getting a new DCC ready chassis from the hornby railroad range to replace its battered (and very coarse scale) chassis. "Staff Competition Entry - 65503"